We have a large range of properties / Real Estate in the Provence – Cote d’Azur region for sale. Provence is a former Roman province and is now a region of south eastern France, located on the Mediterranean Sea adjacent to France’s border with Italy. It is now part of the administrative région of Provence-Alpes-Côte d’Azur. The traditional region of Provence encompasses the départements of Var, Vaucluse, and Bouches-du-Rhône in addition to parts of Alpes-de-Haute-Provence and Alpes-Maritimes. Enjoy the Alps mountains, the glorious countryside, magnificent towns such as Aix en Provence and the chic beaches on the French Riviera / Cote d’Azur. Read our property guides for help. 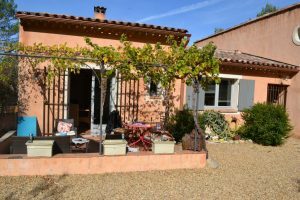 Between wooded spaces and vineyards, this house built in 2004 is in walking distance of the center of Carcès and its conveniences. Looking for a location in Provence Alpes Cote d’Azur? We have offices in the UK and France. If you need help finding a property in Provence Alpes Cote d’Azur, then please ring us. We will be delighted to help you – our telephone numbers are on this page! We can help you with mortgages and currency exchange too. Top 5 restaurants in Provence that You cannot miss to afford? Where to Holiday in Provence?